Doomsday clock, Neil Bergsman of the Maryland Budget and Tax Policy Institute and Kathleen Carmack, a social studies teacher at Governor Thomas Johnson High School in Frederick. 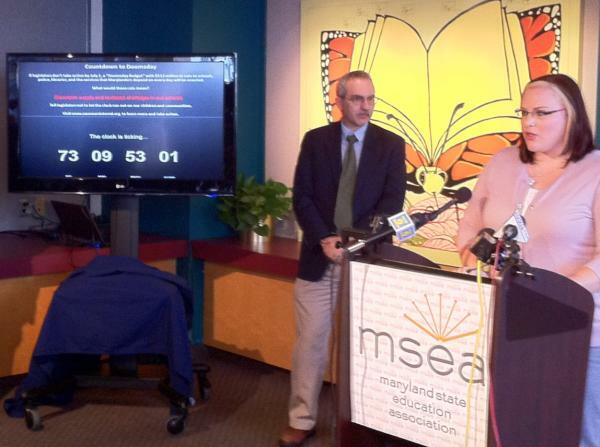 With 73 days until the implementation of the “doomsday budget,” a coalition of Marylanders affected by the potential $500 million in cuts unveiled a countdown clock at a news conference Wednesday. Located online and in the lobby of the Maryland State Education Association in Annapolis, the clock gives a second by second countdown to the July 1 deadline legislators have to call a special session and pass the revenue bill they failed to approve last week. Speaking at the unveiling, several individuals that could be affected by the cuts spoke to reporters, including a librarian and member of the Annapolis Police Department. They called on Gov. Martin O’Malley and leaders in the Senate and House of Delegates to return to Annapolis and approve the tax package that was thwarted by political differences among the two chambers. Mary Baykan, director of the Washington County Free Library, said the budget that emerged the last day of session was not the intent of the General Assembly. “Is closing libraries the vision of the state?” questioned Baykan. Tokunbo Okulaja, a junior at the University of Maryland and daughter of a single parent, expressed concerns about rising tuition costs, which have remained stable in recent years, and her loss of a legislative scholarship that would result from the budget. In addition to the countdown, a ticker above the clock displays the various services that would be affected by the $500 million reduction. Layoffs, tuition increases, and longer lines at the Motor Vehicles Association are among those on display. The press conference comes on the heels of a similar one held Tuesday by Republican delegates urging against calls for a special session. Republicans argue a special session would be “tax-laden” and that the doomsday budget still increases spending by $700 million.